Neurosurgeon Viviane Tabar consults with Clinical Nurse Leader Lystra Swift in the operating room before a patient surgery. Viviane Tabar performs complex surgeries for patients with brain tumors and, outside the operating room, focuses on the relationship between stem cells and brain cancers. 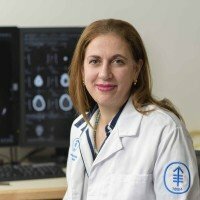 Neurosurgeon Viviane Tabar treats patients with primary brain tumors as well as tumors that have spread to the brain from other parts of the body. She specializes in “mapping” the brain before and during surgery so that she can perform surgeries as effectively and safely as possible, removing tumors and preserving her patients’ quality of life. Here, Dr. Tabar talks about her work as both a brain surgeon and a stem cell scientist. I was initially drawn to surgery because it couples intellect with manual elegance. When I was training in the 1990s, it was obvious that opportunities to improve brain surgery were on the horizon — technologies were becoming available that would allow us to operate more safely and effectively. I knew this would be a field that would explode in my lifetime, and that has already turned out to be true in so many ways. To a great extent, brain tumor surgery has become a form of personalized medicine, as we are now better able to devise strategies for removing a particular tumor both before and during the procedure. At Memorial Sloan Kettering Cancer Center, we have the ability to perform complex surgery with the patient awake and responsive, using advanced navigation systems. We choose an awake approach when the tumor is located in a deep area of the brain or near a region involved in speech expression or speech comprehension. Before going into the operating room, we first perform a traditional MRI, which I liken to a low-resolution Google map. It tells us what the brain looks like and where the tumor is located. Then, we perform a functional MRI, which shows where the brain activates when the patient speaks or moves. The highest-resolution, three-dimensional map is obtained in the operating room. We stimulate particular areas of the brain while talking to the patient until we determine — to the exact millimeter — where nerve cells that control speech and motion reside. 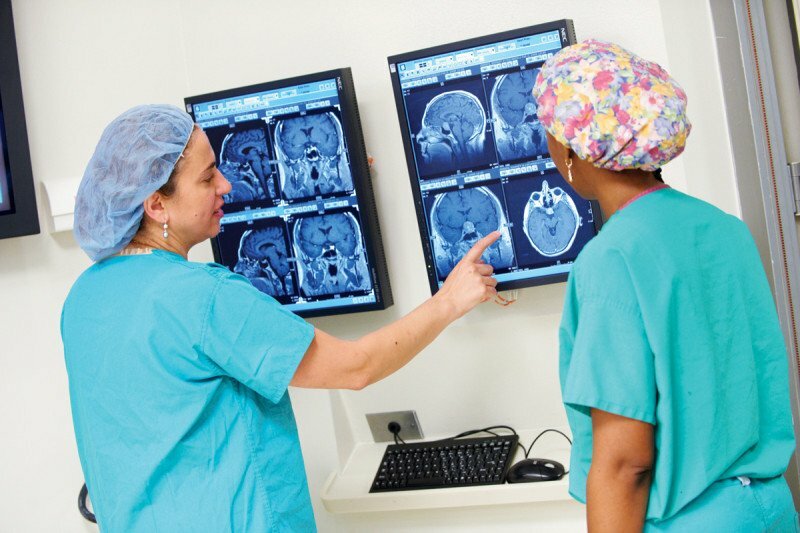 We are also fortunate to have access to an MRI scanner in the operating room for both brain and pituitary tumor surgeries, which allows us to see, as the surgery proceeds, how much of the tumor has been removed and how much remains. With all of these tools — managed by our team of surgeons, anesthesiologists, neurophysiologists, and neurologists — we are able to design a brain operation in real time that takes into account the preservation of a patient’s quality of life. We are also able to remove tumors that would have been previously considered inoperable. Outside of the operating room, I have been translating my research involving stem cells to brain tumors. One of the most striking aspects of stem cells is their flexibility and versatility. They can adapt and respond to both intrinsic signaling and their immediate environment to become a specific type of cell. Glioblastoma multiforme — one of the most common and aggressive types of brain tumor — is recognized for its heterogeneity in appearance and genetics. Scientists have suspected that a small portion of this type of tumor may consist of cancer stem-like cells, which could repopulate the tumor after treatment. This is what drove us to apply some of my previous stem cell research to glioblastoma multiforme and discover that a subset of these tumors can generate their own blood vessels from tumor stem-like cells. Instead of simply recruiting blood vessels, which many other tumors do, glioblastoma multiforme tumors can actually contribute to making their own blood vessels. As a physician-scientist, when I’m operating on a patient and taking out a tumor, I am also thinking about the tumor’s cellular components. I think physician-scientists have a unique role in that they are so close to the subject of study that they are positioned to ask the right questions in the laboratory. This profile was featured in Memorial Sloan Kettering’s 2012 Annual Report. Dr Tabar, do you remember me? You performed a successful pituitary tumor excision on me several years ago. I often think about you and thank God for you. I always hope that you are well. I want to tell you how appreciative I am for your medical treatment through the years. You are truly a gift from God to me. I love you and thank you with all that I have. I wish you more success so that you can help others in their medical needs. See ya in about another year when my next MRI is due. Btw, I am 68yo now and doing well. Au revoir. Dear William, thank you so much for your kind words. We will send them along to Dr. Tabar. Best wishes to you.